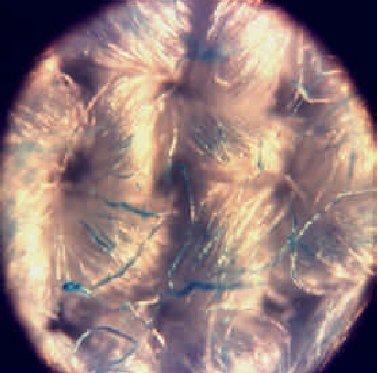 Because the cellulose was not involved in image formation, the color must have formed in impurities on the surfaces of the image fibers. Independent observations have proved that all of the image color resides in a very thin layer on the outside surfaces of colored fibers. Evaporation concentration can explain the superficial nature of the image and the identical properties of the front and back images. It can also explain the "doubly-superficial" image, i.e., the presence of a superficial image on the back surface of the cloth as reported by Ghiberti and Fanti and Maggiolo. When a solution evaporates at the surface of a porous solid, dissolved solutes are concentrated at the evaporating surface. The principle is illustrated in the photomicrograph with blue dye. A piece of linen was saturated with a dilute solution of blue dye, and the cloth was dried while laying on a sheet of Teflon. All evaporation occurred at the top surface, and the dye concentrated on that surface. It is obvious that most of the dye deposited on the highest parts of the weave and the upward-pointing fibers of the nap. A sheet of cloth that contained sugars and starches would deposit those impurities at the very topmost part of the weave after washing and drying.